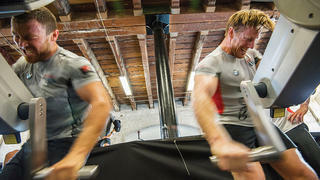 In the first in a series of columns, Jimmy Spithill explains why crew fitness matters more than ever as Oracle Team USA battles to retain the America’s Cup. There’s an old saying that the fastest boat always wins the America’s Cup, and it’s totally true. Next year in Bermuda, the fastest boat will win, no question. It always has. The big difference this time? This is the first time I think the crew can really play a much greater part than they have in the past, because these boats are so difficult to sail. We saw a bit of that during the last America's Cup in San Francisco, but now it’s even more that way. The manoeuvres are so much more important than they’ve ever been, and there’s so much more risk. I think we’ve finally found the right balance, where having the fast boat is critical — you can not win without it — but the sailing teams, the athletes really play a big part. 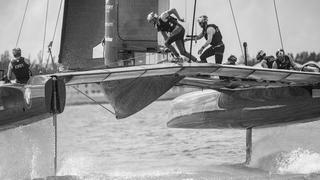 If they screw up a manoeuvre a few times, or worse, if they nosedive or capsize, it could cost them the America’s Cup. On the old Version 5 monohull keelboats, it helped to be strong, but the athletic demands were nowhere close to what we’re dealing with now. The way these boats are, you have more tasks than you have resource or power to handle. So, you’re essentially always heavily undermanned sailing these boats, and often multitasking and covering someone else’s role. Everything is human power and the only way you can adjust things is with the guys turning handles. For example, the more unstable you go with your foils, the more adjustment you’ll have to do. But every time you do that, you’re sapping energy and you’re sapping oil out of the system. You might want to change the twist or shape of the wing, trim the wing or trim the jib, but you can’t do all of it — you have to prioritise. So horsepower is a massive factor. Imagine if you could make a five per cent gain to your engine’s performance in Formula One? That would be huge. Well, that’s what we’re trying to do, why we’re working so hard in the gym. The athletes are the engines on board. If we can get five per cent there, it would make a big difference. The fitness levels have gone skyward. Take a look at the guys in the old photos, the ones driving the monohulls back then; some looked like athletes, but a lot of us didn’t. These days, the guys getting on and off these boats look like paratroopers. They’re real athletes now. 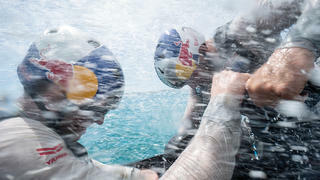 We have to work at an average crew weight of 87.5 kilos (193 pounds), which, compared with how America’s Cup sailors used to be, is pretty small. But even the training has changed enormously. In the past, we would go to the gym, bench press, do a couple of curls — typically free weights — and maybe a run on the field. Our fitness tests were based around how much you could bench press or how many pull-ups you could do. Interestingly enough, you don’t do that much bench-pressing on the boat, you’re not squatting much weight. What you do is a lot of grinding. 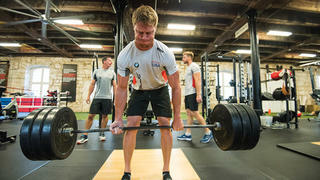 You look at the Olympic rowers out there, and they spend hours on those C2 indoor rowing machines; which makes sense. So, for us, the most important piece of equipment in the gym is the grinding machine. All of our tests are based on that. When we started grinding testing, we noticed that the biggest guys weren’t necessarily the best grinders. And I think that mentality has been around in the America’s Cup for a long time — the bigger the guy, the better the grinder. What we’re finding is that we now have guys that are around 80-something kilos beating guys 90 to 100 kilos at the grinding, because it’s not just bursts when you tack or gybe, it’s 20 minutes nonstop on the grinder. It’s not like you do one tack, then sit down and get out of the wind and take a break while the boat sails for 10 minutes before the next tack. That was the old style. Now, it’s very, very difficult on these grinders. So that has changed the physical demands — the athletes have got to match the boats. Also the playbook and the number of functions each pedestal performs requires multiple split-second decision-making while at exhaustion — get it wrong and you will pay. The boats have incredible power-to-weight ratios currently, more than anything out there, so the athletes now have incredible power-to-weight ratios as well. 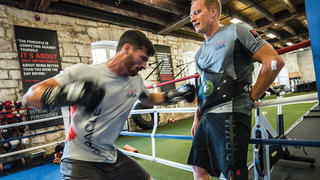 You want guys that are great on their feet and think under stress and exhaustion. They’re extremely strong, have great cardio fitness, but are also not too big because in general, if you’re bigger, you’ll run out of gas quicker. Some of our guys have reinvented themselves, come down in weight from over 100 kilos to more like 90 kilos, and they’re better, stronger athletes than ever before. Reinventing yourself and keeping an open mind to other possibilities is a big part of the whole game. Always asking if there is another way to solve this problem, whether it’s a fitness challenge or a design engineering challenge, is the kind of philosophy we have on our team. Although I don’t think any of the teams are arrogant enough to believe their way is the only way, ultimately you have to look outside your house to really learn something. When you see the talent and makeup of some of the teams, you’d be crazy to think you’re the only one with the answer. I’m happy with our culture at Oracle Team USA. I think we’ve got great people, and that to me is the most important part of any campaign and any team. It’s what I call the no-dickhead rule. It’s also about the fact that everyone here is never satisfied with where they are. They hold themselves to really high standards and they’re not afraid to learn from their mistakes, put their hands up and be candid with one another. They’re always looking for that next step and they’re always turning over the next stone to learn. They’re on an endless search to find a little bit more. I’m not just talking about the sailors either; that attitude is team-wide. It’s not a day job for our shore, design team and our boatbuilders. You can see they’re really into it and they want to do whatever they can. That’s really powerful and maybe it sounds really obvious, too. It’s something that’s easy to say when you’re building a team. But if you’ve got the right people, then you can actually do it. And that’s what I believe all of us are doing every day between now and the end of the America's Cup.